As practitioners of the Buddhist dharma, we continually strive to act in ways that reduce the amount of suffering in the world, both for ourselves and for others. When it comes to animals, the single greatest impact we have on their suffering is the decision to eat – or not to eat – them. In considering a diet that is consistent with the dharma, the scriptures offer a variety of teachings that can help us determine what constitutes Right Eating. For those who aim to live in accordance with the dharma in all aspects of their lives, it is an inquiry that must be made. Only after a thorough and honest investigation can we determine what constitutes Right Action in this area. Any inquiry begins with threshold question of the authenticity of the scriptures and specific teachings within them, and this is the subject of significant and unresolved debate. There is universal agreement that following the Buddha’s final passing the teachings were handed down orally for several hundred years. During that time, Buddhism split into numerous sects, at one point totaling as many as 18, each with their own scriptures. When the scriptures were finally preserved in writing, the written versions differed significantly, reflecting the lack of agreement over what constituted the original teachings. The two largest branches of modern Buddhism are Mahayana and Theravada, and while they have differences, there is also agreement on many, if not most, of the fundamental teachings. Rather than take a position on scriptural authenticity, our discussion will combine both lineages, except for the section on Right Eating. (When citations are from sutras they are Mahayana, and when they are from suttas and Nikayas they are Theravadin.) In both traditions, however, the teachings lead invariably to the conclusion that Right Eating does not include eating animals. The disciple of the Noble Ones, Kalamas, who has such a hate-free mind, such a malice-free mind, such an undefiled mind, and such a purified mind, is one by whom, here and now, these four assurances are found. [T]he Noble Eightfold Path is included by the three aggregates. Right speech, right action and right livelihood – these states are included in the aggregate of virtue. Come, bhikkhu, be virtuous, restrained with the restraint of the Patimokkha, be perfect in conduct and resort, and seeing fear in the slightest fault, train by undertaking the training precepts. First among the moral injunctions, and one that also is accepted and shared by all schools and lineages of Buddhism, is the First Precept – Do Not Kill: I undertake the precept to refrain from destroying living creatures. Abandoning the taking of life, the ascetic Gautama dwells refraining from taking life, without stick or sword, scrupulous, compassionate, trembling for the welfare of all living beings. Here, a noble disciple, having abandoned the destruction of life, abstains from the destruction of life. I am one who wishes to live, one who does not wish to die; I desire happiness and am averse to suffering. Since I am one who wishes to live…and am averse to suffering, if someone were to take my life, that would not be pleasing and agreeable to me. Now if I were to take the life of another – of one who wishes to live, who does not wish to die, who desires happiness and is averse to suffering – that would not be pleasing and agreeable to the other either. What is dis- pleasing and disagreeable to me is displeasing and disagreeable to the other too. How can I inflict upon another what is displeasing and disagreeable to me? Having reflected thus, he himself abstains from the destruction of life, exhorts others to abstain from the destruction of life, and speaks in praise of abstinence from the destruction of life. All beings fear danger, life is dear to all. When a person considers this, he does not kill or cause to kill. One should not kill any living being, nor cause it to be killed, nor should one incite any other to kill. May all beings be healthy. May all beings be peaceful and at ease. May all beings be safe. May all beings be happy. May all beings be free from suffering. These are not idle words or ideas to be taken lightly. They are meant to be lived every moment. Whether they be creatures of the land or air, whoever harms here any living being, who has no compassion for all that live, let such a one be known as depraved. I have loving-kindness for footless creatures; for those with two feet I have loving-kindness. I have loving-kindness for those with four feet; for those with many feet I have loving-kindness. May all beings, all living beings, all creatures, every one, meet with good fortune; may nothing bad come to anyone. Buddhaghosa also made the point, defining Virtue as “the states beginning with volition present in one who abstains from killing living things…” (I 17) In both the Theravada and Mahayana scriptures, in order to abide in the dharma, one must refrain from killing animals. All male beings have been my father and all females have been my mother. There is not a single being who has not given birth to me during my previous lives, hence all beings of the Six Realms are my parents. Therefore, when a person kills and eats any of these beings, he thereby slaughters my parents. Furthermore, he kills a body that was once my own, for all elemental earth and water previously served as part of my body and all elemental fire and wind have served as my basic substance. It is not easy, bhikkhus, to find a being who in this long course has not previously been your mother…your father…your brother…your sister…your son…your daughter. When you kill a cow or a chicken, you are likely killing a creature that was once a close relative. Bhikkhus, a lay follower should not engage in these five trades. What five? Trading in weapons, trading in living beings, trading in meat, trading in intoxicants, and trading in poisons. What kind of person, monks, torments himself and pursues the practice of torturing others? Here some person is a butcher of sheep, a butcher of pigs, a fowler, a trapper of wild beasts, a hunter, a fisherman, a thief, an executioner, a prison warden, or one who follows any other such bloody occupation. This is called the kind of person who torments others and pursues the practice of torturing others. Here, someone destroys life; he is murderous, bloody-handed, given to blows and violence, merciless to living beings…His destination is crooked; his rebirth is crooked; But for one with a crooked destination and rebirth, I say, there is one of two destinations; either the exclusively painful hells or a species of creeping animal. In short, the proscription against killing or causing another to kill an animal is undisputed in the Buddhist teachings. It is the foundation of morality, which is the cornerstone of the development of concentration and wisdom. The killing of animals has no place in the dharma. While the basis for vegetarianism, even veganism, is found in both the Mahayana and Theravada lineages, it’s presentation is markedly different. Accordingly, the specific teachings of the respective traditions will be discussed separately. Thus, Mahamati, whenever and wherever there is evolution among sentient beings, let people cherish the thought of kinship with them, and holding the thought intention of treating them as if they were our only child, and therefore refrain from eating their flesh. For a Bodhisattva to keep good integrity with the Dharma, he or she should not make any exceptions to the eating of animal flesh. Nor should a Bodhisattva eat flesh sold by others for monetary profit. …let the Bodhisattva discipline himself or herself to attain compassion and refrain from eating animal flesh. The food of the wise, which is eaten by Sages, does not consist of animal flesh or blood. Therefore let the Bodhisattva refrain from eating animal flesh. In order to guard the minds of all people, Mahamati, let the Bodhisattva whose nature is holy and who wishes to avoid unnecessary criticism of the Buddha Dharma, refrain from eating animal flesh. There is no animal flesh to be regarded as pure by any exception. It does not matter if the giving of animal flesh for us to eat is premeditated or not, asked for or not, or whether extreme hunger is present or not. Therefore it is wise to not eat animal flesh in any circumstance which naturally arises within our life. Let yogis not eat any animal flesh. All Buddhas teach all people to not eat animal flesh, and especially wish those under their guidance to not eat animal flesh. Sentient beings who feed on each other will be reborn as carnivores in the animal realm. Animal flesh eating is rejected by Buddhas, Bodhisattvas, and Disciples. If a person eats animal flesh out of shamelessness, he or she will not be able to cultivate a wholesome sense of what is appropriate. Let a person not give power to the many rationalizations given to justify animal flesh eating. What logicians say under the influence of their addictive craving for animal flesh is sophistic, delusional, and argumentative. What they imagine that they witnessed, heard, or suspected that the Blessed One has said, or another Buddha said or did, is grossly distorted. As greed is a hindrance to liberation, so are the objects of greed a hindrance to liberation. Objects of greed like animal flesh eating and consuming alcohol are hindrances to liberation. A time may come when deluded people may say, “Animal flesh is appropriate food to eat, has no karmic consequences, and is permitted by the Buddha”. Some will even say that eating animal flesh can be medicinal. It is more like eating the flesh of your only child. Let a yogi be attuned to what is balanced and nourishing to eat, be adverse to consuming animal flesh and alcohol, and with this clarity go about peacefully begging for food, trusting that what is wanted and needed to sustain a healthy life will be supplied. In short, in the Mahayana scriptures the proscription against eating animals is explicit and conclusive. Unlike the Mahayana scriptures, in which eating animals under all circumstances is repeatedly and explicitly condemned, the Pali canon provides much less direct guidance in this area. While one passage, discussed in the next section, suggests a narrow exception to the general principle of not eating animals, the totality of the teachings nevertheless leads to an undeniable conclusion – eating animals is inconsistent with the Theravada scriptures. Just as the First Precept’s admonition to not kill is a manifestation of compassion, so too is the decision to stop eating animals. In order for you to eat a steak or a chicken, at some point in the process the animal has to be killed. That’s inescapable. And with today’s mass production of meat, the sheer number of animals killed is staggering – estimated at 50 to 70 billion a year worldwide – as is the amount of suffering inflicted on those animals, most of whom are raised on commercial animal farms. While the slaughter may be hidden from sight and done by others, when we purchase meat we are soliciting that killing act. We are asking those who work within the meat and dairy industry to do the killing for us so that we can eat that hamburger or chicken. We are complicit, and the teachings are very clear on this point. Whether you kill the animal yourself or pay someone else to do it, you cannot escape moral responsibility. By participating in the system, we contribute to both the suffering of the animal and the act of taking its life. Given the numbers we may be only a tiny fraction of the overall consumption, but however marginal, we cannot distance ourselves from the culpability. Looked at another way, if no one ate meat no animals would be killed. Animals are killed only because there is a demand for meat. Animals are killed only because there is a demand for meat. When we buy meat at a store or restaurant, another animal will be killed to replace it. By abstaining from eating animals, we reduce the demand and thus the killing. By eating animals, we increase the killing. 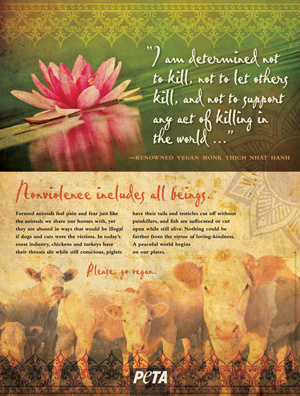 The principle of not taking part in any aspect of the meat industry, whether you kill the animal yourself or not, is also implicit in the Noble Eightfold Path factor of Right Livelihood, which lists five trades or businesses that cause harm to others and should thus be avoided. (See Vanijja Sutta, supra.) One of the businesses – trading in meat – prohibits selling meat, and trading in living beings includes raising animals for slaughter. The fact that raising animals and selling meat, in addition to the actual slaughtering, is proscribed by this path factor, makes it clear that it is not simply the person killing the animal who is doing harm. If raising the animal is Wrong Livelihood and selling meat is Wrong Livelihood, how can purchasing and consuming the meat be Right Eating? Anyone who participates in the process in any capacity is causing harm, and this includes those who eat the final product. The decision to stop eating meat is an act of compassion consistent with the First Precept. To continue to eat meat is a violation of this paramount Buddhist quality and is inconsistent with the practice of nonharm in all aspects of one’s life. *In the original Pali text, the sentences end after the word ‘suspected.’ In his translation Ven. Ñāṇamoli inserted a bracketed section – [that the living being has been slaughtered for the bhikkhu] – an insertion retained by Ven. Bodhi in his editing. For those who rely on the three purities to justify meat-eating, the logic goes as follows. According to the three purities, if an animal is not killed for you, then it’s okay to eat it. When you eat meat purchased at a market, butcher shop or restaurant, the animal is not killed for you. Therefore, it’s okay to eat meat under these circumstances. The crux of the matter is the question of whether meat bought at a market or restaurant is from an animal that was killed for you, and this question has already been answered. Whether it’s a big and complex corporation or the small butcher shop in your supermarket, the meat industry kills animals so that buyers in the marketplace can buy them. When you buy meat from them, you are the person for whom the animal was killed. If not for you and others like you, the animal would not have been killed. The only way to get around this is to take an extremely literal and narrow interpretation of the three purities which would require that the specific animal be killed specifically for you, not for the consumer in general. It’s certainly the case that when the butcher was killing the animal he didn’t do it with you personally in mind. But is this in accord with the intent of the doctrine, or is it going out of your way to justify an action that is inconsistent with the spirit of the teachings? Come, Kalamas, do not go by oral tradition, by lineage of teaching, by hearsay, by a collection of scriptures, by logical reasoning, by inferential reasoning, by reasoned cogitation, by the acceptance of a view after pondering it, by the seeming competence [of a speaker], or because you think: ‘The ascetic is our guru.’ But when, Kalamas, you know for yourselves: ‘These things are unwholesome; these things are blameworthy; these things are censured by the wise; these things, if accepted and undertaken, lead to harm and suffering,’ then you should abandon them. For many, the practice of eating animals is difficult to abandon. But the question of eating them is central to the dharma, and like all others, it requires us to take a hard and critical look at our own practices. Even if the outcome makes us uncomfortable or leads to an unwanted change in our eating habits, it is change we must embrace if we are to progress along the path. The lineage of vegetarian and even vegan monks and teachers is long and distinguished. Many of these noteworthy Buddhists have spoken eloquently about the subject of eating animals. “Some Buddhists maintain that the Buddha never said we should be vegetarians, and that monks (who the bulk of the Buddhist rules apply to), may eat whatever is offered to them, as long as they do not see, hear, or suspect that the animals, fish or fowl were killed especially for them; if they so see, hear or suspect, they are forbidden to eat the flesh. But this standpoint is totally indefensible, as anyone who looks at things a little objectively can see. And to say, as some people do, that by eating meat, they are helping the animals with their spiritual growth, is too ridiculous and transparent to be seriously considered for a moment. “The beings with unfortunate karma that we are supposed to be protecting are instead being killed without the slightest compassion, and their boiled flesh and blood are being presented to us and we —their protectors, the Bodhisattvas— then gobble it all up gleefully, smacking our lips. What could be worse than that? “Flesh-eating is wicked, for we should not kill, nor cause to kill. To purchase flesh in the bazaar is to cause slaughter; for the supply is proportional to the demand. […] “He who consents to the killing, he who strikes, he who slaughters, he who buys, he who cooks, he who serves, he who eats —they are all murderers.” These are the words of Manu, an Indian philosopher. So everyone is an accomplice in the murderous game; beginning from the butcher and ending with the one who eats. There is a common belief in Buddhist countries that any one may eat flesh provided he does not kill the animal with his own hands; but it is not so, because eating is the cause of slaughter. If we become vegetarians, all the butchers will have to close their shops and turn to a better profession. By eating flesh we keep a class of people in a miserable profession. It is not fair that we should force the butchers to go to hell for our sake. If we become vegetarians, then the whole world would be at peace. “Aware of the suffering caused by the destruction of life, I undertake to cultivate compassion and learn ways to protect the lives of people, animals, plants, and minerals. Anyone familiar with the numerous accounts of the Buddha’s extraordinary compassion and reverence for living beings —for example his insistence that his monks strain the water they drink lest they inadvertently cause the death of any micro-organisms— could never believe that he would be indifferent to the sufferings of domestic animals caused by their slaughter for food. The noble Ariya Pudgala ( Persons) once steps in the stream to Arahathship abstains from eating flesh of animals. This fact is evident from Buddhist scriptures, contrary to the arguments put forth to find avenues to consume the flesh of animals by adherents. Further research should be encouraged along these lines in order that all Buddhists adhere to this noble practice. First the evidence that the “Last Meal of Buddha” was a non poisonous mushroom, not pork, is overwhelming. Next the scriptures, not only the Buddhist Canon, should be examined to elucidate the Buddha tradition in our daily lives. A scholarly evaluation of the evidence should be presented to the leading Sangha members in Sri Lanka, Burma, Thailand in order to correct the misconception of Buddhas’ eating meat. There is some movement towards this effort from some of the Sangha members here in the U.S.A, However, no concrete effort seeems to have taken place yet. It would be a good opportunity and a deed that would bring your organization to the forefront( limelight) in compassion and vegetarianism if the members take lead to implement this noble truth with evidence . That no Ariya Buddhas ate meat. .
For anybody wanting to further their compassion for all sentient beings and becoming vegan, the 30 Day Vegan Easy Challenge has helped thousands of people transition to vegan. Please see http://www.veganeasy.org for more information on being vegan and to sign up for the challenge. I have seen your video http://youtu.be/S0MWAAykFuc and also read above article. It is clear to me that by eating meat we indirectly promote killing and cause suffering to animals. 1. In nature we have the food chain (e.g., rats are eaten by snake, snakes are eaten by Eagles…) which is important to balance the Eco-system. So by law of nature, animals kill each other for food. 2. Plants are also living things. (E.g., the grow and bear fruits). How can we say that when we break a fruit from a tree or uproot onions from the roots; we are not causing pain to the trees? How are above points explained in Bhuddhism? Thanks for your post. Your questions are asked all the time. Many books and articles have been written answering them. Since humans can reason, unlike other animals, when we see, as you do, that by eating animals we cause and support their unspeakable suffering, we stop doing it. It’s simple. Read Will Tuttle’s book, World Peace Diet, for a detailed explanation that our jaws and teeth are actually developed not for eating animals but for eating plants. Whenever we make a conscious decision to support killing and violence over compassion and non-harming, the karmic effects are strong according to the Buddha’s teachings. Your second point that plants are living beings can also be easily answered. It takes ten grams of plants to produce one gram of animals flesh, so for those who really care about plant lives, you save ten times as many by eating them directly rather than indirectly by eating the animals who fed on the plants. Secondly, there is no reliable evidence that plants feel pain, so plants are not sentient beings and not within the Buddha’s circle of compassion/non harming. why do you need religion to decide whether it’s okay to kill another creature for food or enjoyment? use your own wisdom. gawd.